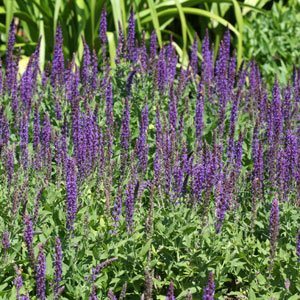 One of the many salvia species found for sale in Australia, Salvia nemorosa is a hardy plant originally from Europe and Asia. Flowering from late spring through summer it can be regard as a drought tolerant frost hardy plant. One of the first cultivars we grew was S. nemorosa ‘Ostfiesland’ (picture right) a German cultivar with magnificent purple flower spikes reaching around 1/m. It looks great planted in a drift. S.nemorosa ‘blue hill’ has paler blue flowers and is perhaps a little lower growing reaching around 2/3m. Not all S. nemorosa cultivars are purple and blue, you can also buy S nemorosa ‘snow hills’, a lovely white flowering plant that acts as a great contrast, like all salvias this one attract bees and butterflies as well a birds. S. nemorosa grows well in a dry position but will also flourish in a humus rich moist well drained soil. When planting we like to dig in some well rotted compost and then water in plants with a liquid seaweed solution. The beauty of the S.nemorosa group is that they as very easy to care for, they can be cut back after the first flush of flowers and will repeat flower in spring, yes a mid summer pruning and these plants will bounce back. Cut them back as winter sets in and then as spring comes and new growth commences mulch around them with compost and some well rotted animal manure, water again with the seaweed solution and you are done until S. nemorosa needs its mid season hair cut. Salvia nemorosa ‘Caradonna’ with violet blue flowers. Some dwarf or low growing cultivars and Salvia nemorosa ‘Mainacht’ or ‘May Nights’. 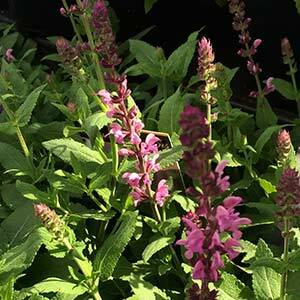 Salvia nemorosa ‘Amethyst’ is a lovely pink flowering cultivar which is relatively low growing at around 60cm. Also look for S.nemorosa ‘Kate Glenn’ lovely deep purple flowers.